It is with deep pain and infinite rage that we, 691 women human rights defenders from El Salvador, Guatemala, Honduras, Mexico and Nicaragua, who make up the Mesoamerican Women Human Rights Defenders Initiative (IM-Defenesoras), express our condemnation for the cowardly murder of our compañera Berta Cáceres, a feminist and advocate for the ancestral rights of the Lenca nation. Berta was also the coordinator of Consejo Cívico de Organizaciones Populares e Indígenas de Honduras [COPINH, Honduras' Civil Council of Grassroots and Indigenous Organizations] and a member of Red Nacional de Defensoras de Derechos Humanos en Honduras [Honduras' National Network of Women Human Rights Defenders]. In the early hours of Thursday, March 3, Berta Cáceres was murdered by unknown persons who broke into her home in La Esperanza section, Intibucá department, in the country's South-West. 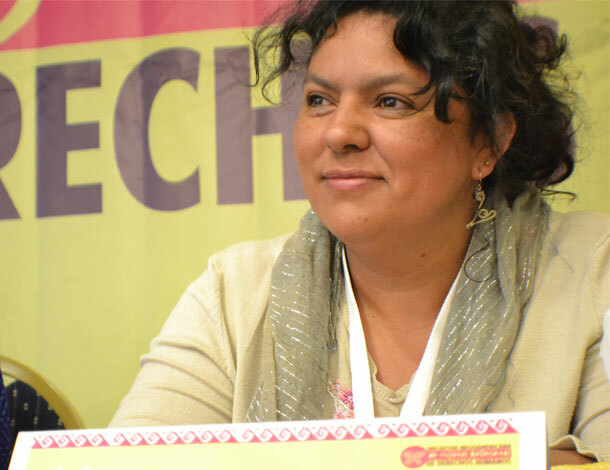 A week earlier, Berta Cáceres had called a press conference to report that four leaders of her community had been murdered and others had been subjected to threats. All this took place in a context of escalating attacks and harassment against COPINH and the communities resisting the hydroelectricity project of the DESA-Agua Zarca company. It is worth mentioning that throughout her years as a defender, she had been subjected to multiple attacks including threats, arbitrary arrests or criminalization by those linked to the private company DESA-Agua Zarca, and also by Honduran State officers and entities. 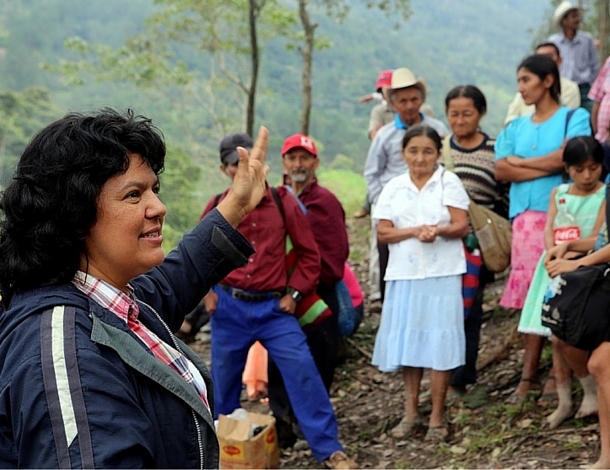 For this reason, Berta Cáceres was granted precautionary safety measures by the Inter-American Commission of Human Rights (IACHR). In deep pain and outrage, we want to convey our deep thanks to her, and acknowledge the privilege it has been to have had Berta as our compañera. As well as highlight the work of this women human rights defender who has been, is, and will always be an example for us all. We particularly acknowledge her invaluable work for the rights of Lenca women, and throughout Mesoamerica, carried out with a feminist and comprehensive human rights approach. In these difficult times, we also want to express our solidarity and support to her family, to the Lenca people and to all others COPINH members. Reject any hypothesis filtered through the media that is not based on an investigation conducted according to the law and supported by international mechanisms. We also reject any attempt to criminalize human rights defenders linked to Berta Cáceres. We demand the safety of Berta Cáceres' relatives and close associates, as well as of COPINH's women and men human rights defenders. Finally, we demand that this crime be solved through an investigation supported by international bodies. Ni una menos! Justice for Berta! 'Not one less' (ni una menos) was the theme of a very large protest (200,000 people) that took place on June 3, 2015 against femicides in Argentina, Chile and Uruguay. It continues to be used as a popular slogan. Sign the petition: Justice for Berta!